The quiet beaches of the Kannur district, untouched by large-scale tourism common to south Kerala's beaches feels pretty close to paradise. Walking along the coast you will pass deserted beaches, small Keralan villages, groves of coconut trees and wide rivers that empty their waters into the sea. The friendliness and hospitality of Keralan locals, combined with the beauty of a landscape that took my breath away made this a completely memorable experience. This guide explores Muzhappilangad beach, Dharmadam island, Thalassery town and the surrounding coast, all in Kerala's Kannur district. This region is undeveloped in respect to tourism - accommodation is harder to find and usually more expensive than in the popular tourist districts. The opportunity, however, to enjoy the quiet beaches of this beautiful part of India is unique. 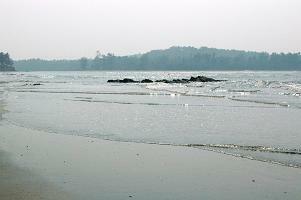 Undiscovered Bollywood stars flock to Muzhappilangad beach on the weekends to drive or ride along this romantic shore. 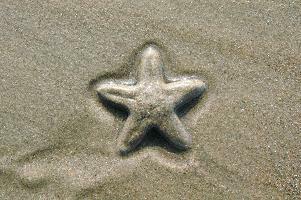 The beach is far quieter in the day, with perhaps the odd tuk tuk, or starfish. The water is shallow and calm, so great for swimming. We stayed at the only accommodation on the beach, the beautiful Palm Shore Beach Resort. A little expensive if you are on a tight budget, but there is little choice in this area - we paid R.700 a night for a downstairs room. The food was fantastic, cheap and authentic - spicy Keralan food served at the hotel by request. We found no other restaurants nearby, but loved their food so much we didn't care. The staff were exceptionally friendly and helpful. Upper-floor rooms have views of the sea - lower rooms the sound of the sea. From the drive-on beach, we walked south along the coast towards Thalassery. The number of people we passed was thinning, now it was mostly fishermen dragging in their boats from the sea. A large communist symbol sat on a rock, a reminder of Kerala's political leanings. We walked on along the coast past uninhabited Dharmadam island (visitors can access it by boat or on foot at low-tide and explore in the tropical island). We came inland where a river met the sea, walking under the graceful palms to cross the bridge. The vivid green of the riverbank was splashed with colour by Kingfishers and fishing boats. When we passed a small village, children shook our hands, smiling in delight. Back on the sea front after several quiet beaches, we came to a steep headland and a friendly stranger helped us pick our way to the top of the rocks without saying a word. At the top we met a man who said rather a few words, and took us on a tour of his house. He had just bought it and was thrilled to show us. Perched on the cliff with a sandy bay below and a huge expanse of glittering sea it was so wonderful that we barely knew what to say. The proud home owner (who told us he was considering building tourist cottages on the property) pointed us in the direction of the road and arranged us a tuk tuk, since by now we had decided to go on to the nearby town of Thalassery. Thalassery is the first town in India where cricket was played, and we were lucky catch locals playing an impromptu game in a dusty village square by the sea. 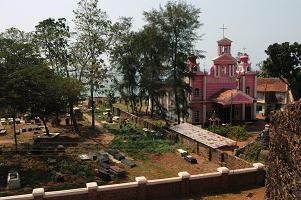 Thalassery Fort, constructed by the British in 1708 gives good views of the surrounding coast. Just outside a small stall holder let us try the local snack - pickled mango! We ate a late lunch at Hotel Pearl Regency (R.10 rickshaw ride from the Fort) where the staff were kind enough to set up a table for us outside under the trees. Inexpensive but delicious thalis (read more about thali on the Keralan food page) were on the menu as well as, to our delight, Kingfisher beers. Thalassery is connected to the major town of Kannur (20km north) by rail and public bus, though it is also possible to book a taxi or rickshaw. Rickshaws cost around R.10 per km. Slightly more may be required if travelling on the highways. Kannur is an important rail hub in south India, connected to many Indian towns/cities. The nearest airport is Calicut International Airport (also referred to as Karipur Airport) 115 km south of Kannur at Karipur in the Malappuram district. Some international flights leave from here but it is mainly used for air travel within India, with daily planes to Mumbai. Rickshaws are helpful for shorter distances. Carry your hotel's card with you so that if on your explorations you should get lost, you can hail a tuk tuk and show the card. Rickshaws should cost between R.10 - R.20 per km in non-touristy areas. If travelling by bus, fares are incredibly cheap. Hoteliers should be familiar with local services. At busy bus stops conducters call out the destination of their bus and can be very helpful in pointing you in the right direction. When travelling in non-touristy areas, people are generally very helpful and interested. North Kerala is a religious, rural area and respect to locals involves dressing appropriately, i.e. loose fitting adequate clothing and refraining from physical affection if you are a couple (in publc, at least!) On the quiet beaches of north Kerala, women may feel more comfortable swimming in t-shirt and shorts. You rely more on your own initiatives when travelling off the beaten track. India can be busy and confusing, especially the towns. Talking to local hoteliers, shop or restaurant owners is a great way to get to know the area, and recieve advice on travel. Find quiet beaches in Goa (yes, they do exist!) with our guide to the beaches in Goa. 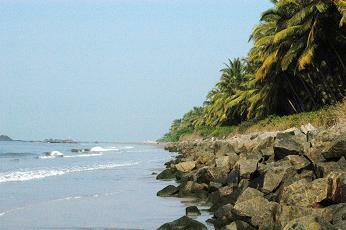 Discover more beaches of Kerala!